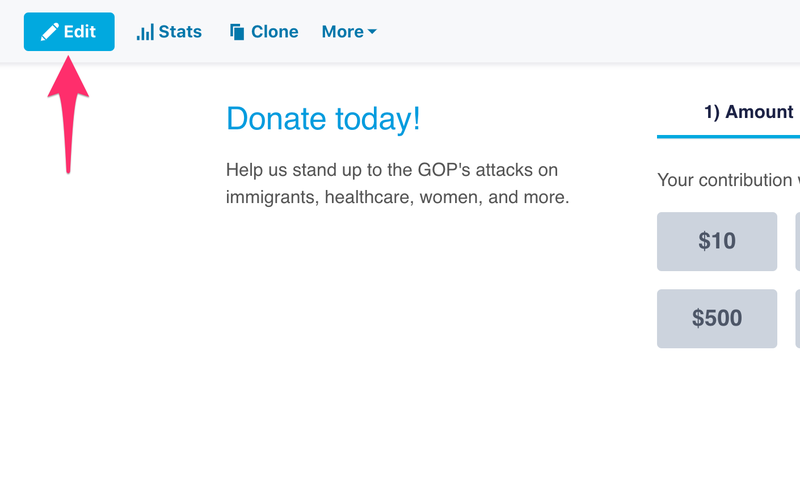 You can set the donation buttons on your contribution forms to any amount you want. While donors will always have the ability to enter their own amount, the preset contribution amounts set a frame for how much donors might want to give. To set your contribution amounts, use the form editor. Go to the Contribution Forms tab of your Dashboard and click on "Edit" button next to your form's name to open the editor. Click the "Edit" button, the first button on the form navigation bar (form navbar) at top. 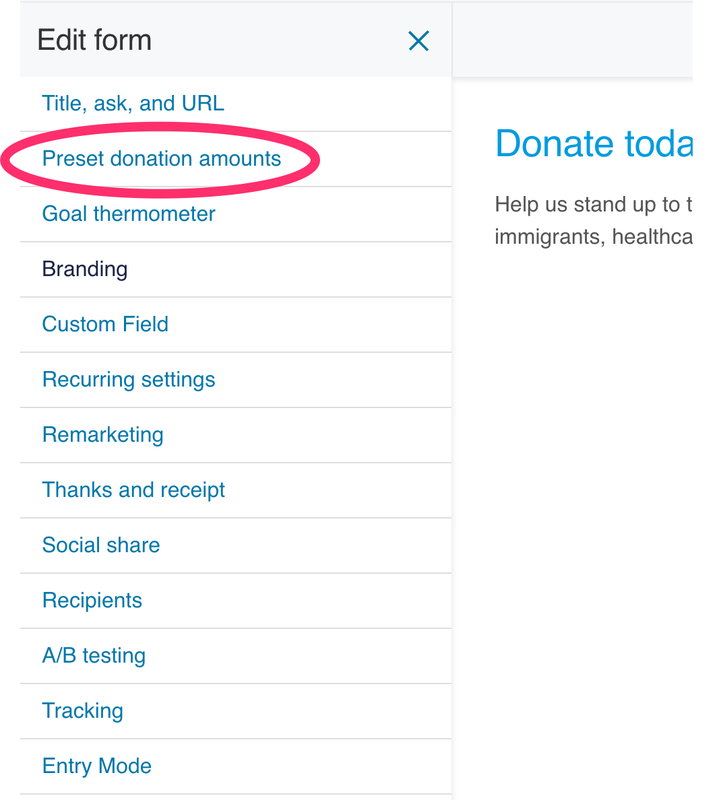 Then select "Preset donation amounts." You’ll see a field where you can enter your preset contribution amounts. You'll be able to see the buttons on your form change as you type in the donation amounts! List up to seven amounts separated with commas and no spaces. It’s important to offer a range of contribution amounts on your form -- if your lowest preset contribution amount is $100, some donors who can only give $10 may feel like their contribution won’t matter and choose not to contribute. Once you're happy with your contribution amounts, don't forget to click the green "Publish" button. 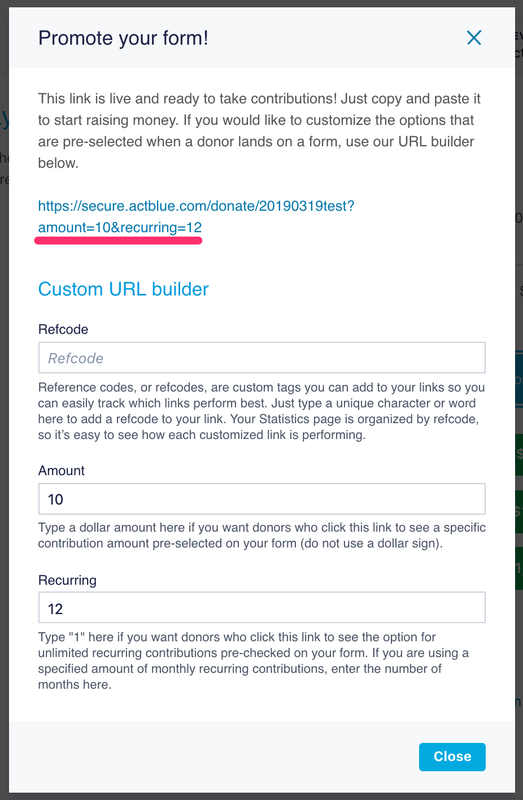 If you’re fundraising through an email, you can also preset the contribution amount and number of recurring months (if you’re asking for recurring contributions) by customizing the links you include in the body of the message. To do this, close the form editor, click the "More" dropdown, and select the "Promote" button. Fill in the dollar amount and number of months the donation will recur for on this page. As you can see below, the link will be customized with the contribution amount and number of recurring months. Then you can drop this link into a fundraising email! 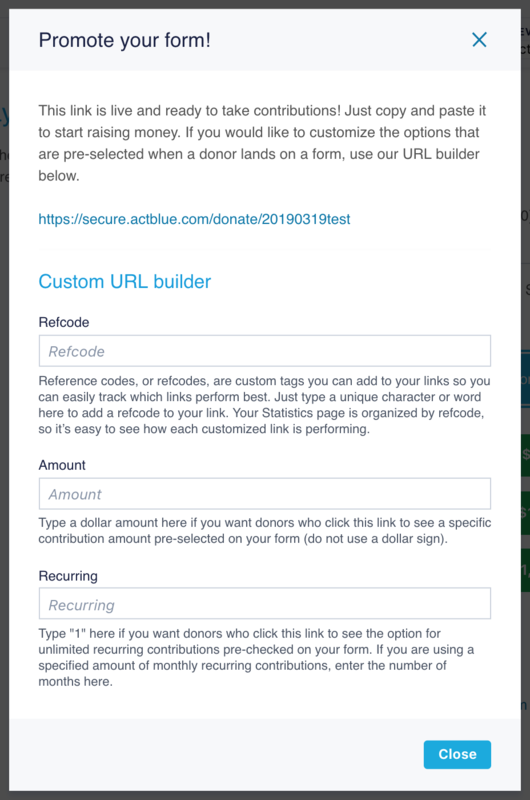 When a donor clicks on this link, they’ll see the buttons for that amount and number of recurring months preselected on the contribution form. 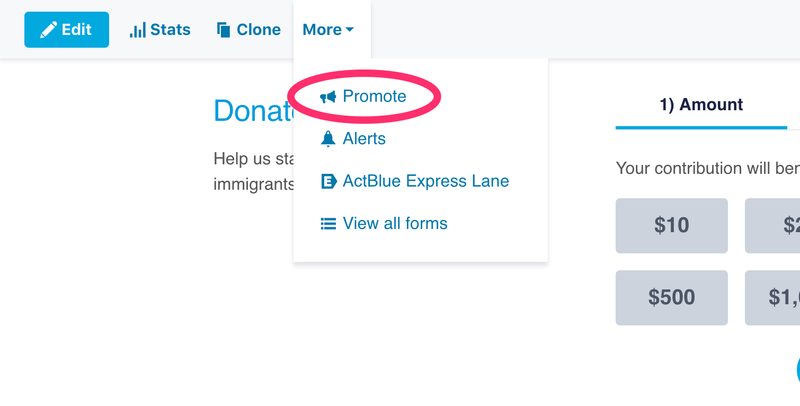 If your committee is set up with ActBlue Express Lane, and an ActBlue Express user clicks on one of these links, their contribution will process automatically for that amount and number of recurring months. To learn more about ActBlue Express Lane, click here. 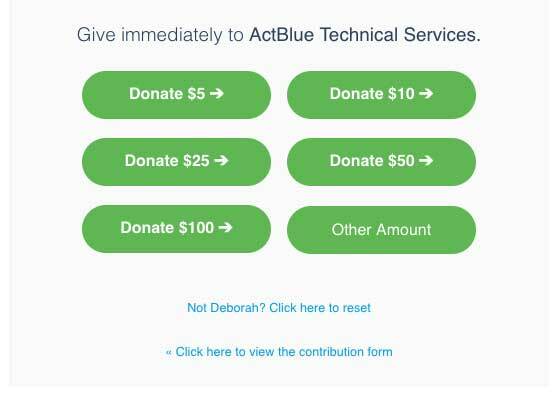 To inquire about getting your committee set up with ActBlue Express Lane, reach out to us at support@actblue.com.